Select Size3.4oz.25 oz.12 oz.64 oz. 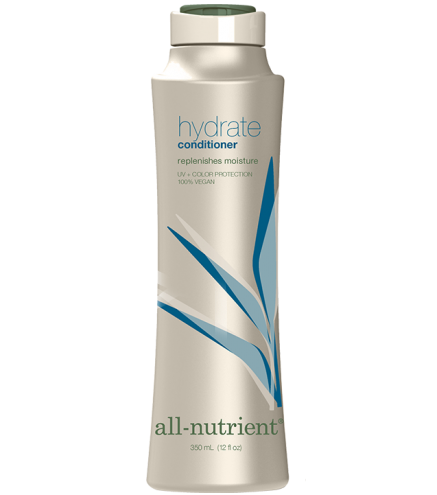 Hydrate Conditioner is a plant-infused formula, rich in amino and essential fatty acids, that restores moisture and vitality to dry, brittle hair. Rainforest Cupuaçu Fruit penetrates deep within the follicle to create a smooth, new surface on the hair. An exclusive Omega Fatty Acid Complex softens the hair at the root to equalize the lipid balance and impart lubricity and shine. Coconut Oil offers tremendous moisture retention, keeping the hair hydrated and healthy. Apply to damp hair, distributing evenly throughout, and rinse. For extra conditioning, leave on the hair 3 to 5 minutes. Best for normal or dry hair.